Tabbouleh is a go-to dish when cleaning out the vegetable bin which I seem to be doing a lot these days. I am still learning to adjust my shopping list to more appropriate levels for someone who is in culinary school. Three nights a week I get fed at school and I bring home leftovers of all the foods I prepare during class. There is a surplus of food in my fridge and sometimes I forget to purchase less when I head out to the store. Even if you don’t need to clean out the veg bin, tabbouleh is a great dish to have on hand. It keeps well, and even gets better as the flavors meld together over the course of a day or two. I snack on it throughout the day and if you need a quick side for dinner, it is always great to have this sitting in the fridge waiting for you. Love those time savers. Tabbouleh is traditionally made with bulgar wheat, which is what I used here, but I often use couscous, wild rice, wheat berries or basically any grain (or pasta in the case of couscous) that I have on hand. Traditional vegetables include tomatoes and spring onions with a healthy does (usually an entire bunch) of chopped parsley, but since I use this salad as a dumping ground for leftover vegetables, I do not always stick to the traditional and neither should you. In this rendition I use tomatoes, cucumbers and shallots, but in the past my tabboulehs have also included zucchini, eggplant (cooked), celery, squash and so on. The only real guidelines you should follow are to chop the vegetables small - I usually aim for a similar size to the grain I am using – and to use lots and lots of parsley. Cook the bulgar or other grain according to package directions. Spread the cooked grains out on a parchment paper lined baking sheet to cool quickly. 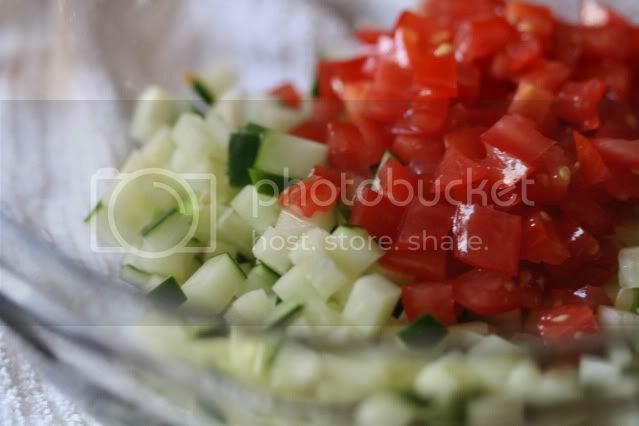 While the grains are cooking, chop the cucumber, tomatoes and shallot finely. Sprinkle the vegetables with salt and pepper and set aside. Chop the parsley finely, rocking your knife back and forth through the herb to make quick work of the bunch. 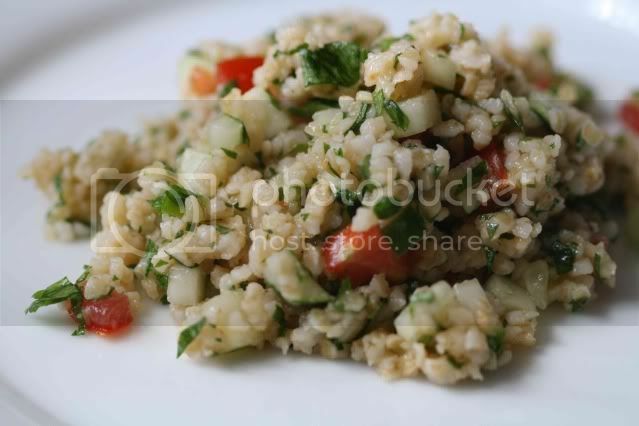 Once the bulgar has cooled, combine it with the vegetables, parsley and lemon juice. Add 3 tablespoons of olive oil. You want the salad to seem moist, but not oily. If necessary, add more olive oil. Taste and add more salt and pepper to your liking. The salad is ready right away, but gets even better after some time in the refrigerator. As my year in culinary school wore on, I found I kept less and less food around the house. I would eat lunch at school (whatever we made) and get dinner at work (in a Mexican restaurant - sometimes it was little more than chips and salsa). Pretty much all I went to the store for was granola bars. Hope you keep up the good eating habits! Look at those beautifully cut veggies!! I agree with Tigerlily, those are some beautifully cut vegetables. I like the idea of a revolving inclusion of grains or pasta in tabbouleh. Love this middle eastern style salad. I find the best way to use up leftovers in my refrigerator is to invite my friends over to enjoy it. You are right, it's even better after sone time in the fridge! Your knife skills are certainly up to par! 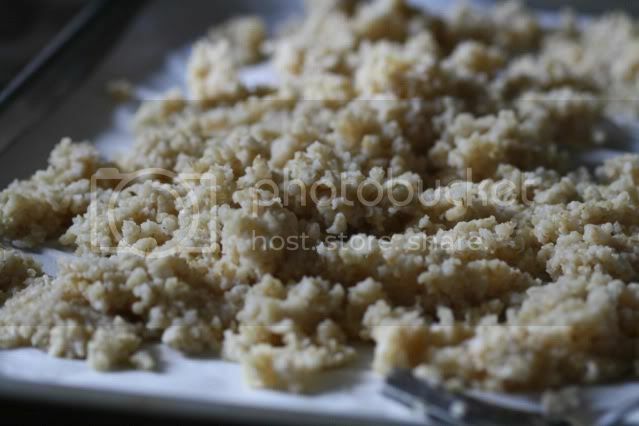 Great photos and I'm so glad that you are open to making it with a variety of different grains! This looks super delish and like the perfect thing to keep on hand when you're looking for something healthy to snack on.